For this Los Angeles bat mitzvah at Greystone Manor, a West Hollywood night club and event space, party planner, Ilana Wenger, chose to cover the venue's large, framed artwork with portraits of the bat mitzvah girl. 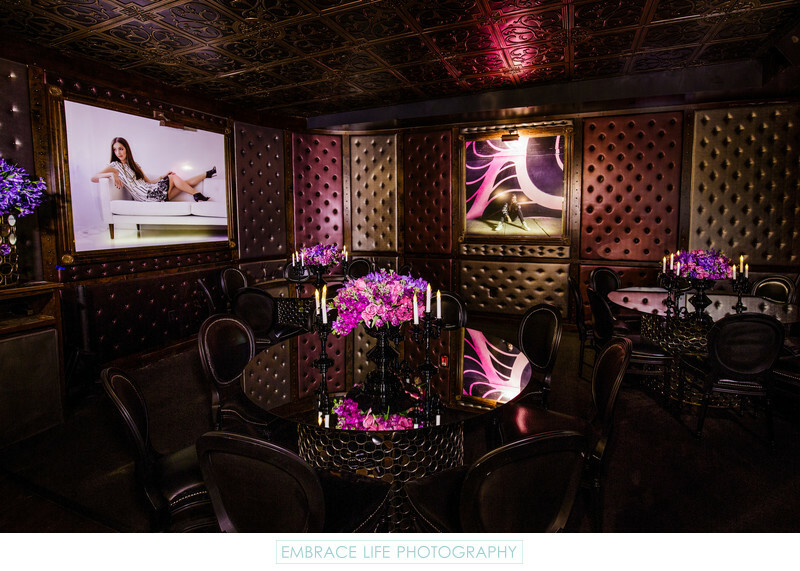 Embrace Life Photography photographed the bat mitzvah girl in a loft photo studio in downtown Los Angeles, and in front of a beautiful mural, which perfectly matched the color scheme of this glamorous party, in the city's arts district. Purple floral centerpieces, by Sky Flowers, in black vases are surrounded by black candle holders and white tapers on the dramatic mirrored tables in the dining area.